This article was first published by the now defunct Space Wolves Blog back in 2014. We have re-published it here to keep it from being lost in the warp. The points values may have changed. Space Wolf Iron Priests are the mystical tech marines of the Space Wolves Chapter. They bless the machines, appease the spirits of plasma and flame while converting failed Iron Priest aspirants into servitors and wounded Fenrisian wolves into Cyberwolves. As with all things Space Wolf, technology and the Iron Priests are surrounded by mysticism and myth. Fortunately, fielding an Iron Priest in a Space Wolves army is far more straightforward! I can see Iron Priest being overlooked in favour of other Elite choices, but this doesn’t mean that an Iron Priest doesn’t have his uses. 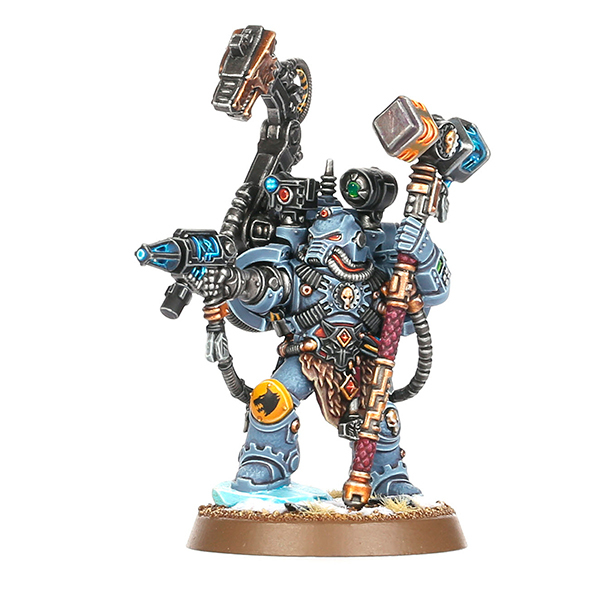 An Iron Priest is essentially a Space Wolf with an extra attack in his profile, but he also comes with Runic armour (2+ save), a servo arm, a bolt pistol or bolter, a Thunder Hammer and frag n’ krak grenades. He also has the Battle Smith rule that allows him to repair vehicles. So, considering his equipment, he’s not bad for the points. But let’s have a look at his wargear options. 0-4 Cyber Wolves – Awesome units for their points. 0-4 Thrall Servitors – Essentially Guardsmen with powerfists. But they help him repair. Multimelta for servitor – Will he be in range or live long enough to use it? Plasma Cannon for servitor – Too expensive! Thunderwolf Mount – Oh hell yes! Melta Bombs – If you have 5pts going spare. But not essential for this chap. There are only 2 really good builds for an Iron Priest. The Iron Priest build that everyone loves! A unit of 5 Toughness 5 models with plenty of attacks. He also gets +1 Wound from his Thunderwolf Mount. Combine this with his 2+ armour save and he becomes a tough little assault unit. This is the load out for sitting in or walking alongside a vehicle and constantly repairing it. Each Servitor gives you +1 to your 5+ Battlesmith roll, so your Iron Priest will be repairing repairing on a 1+ (the roll of a 1 is always a fail) until you start losing Servitors. I’ve seen people run this repair crew behind a battery of 3 Vindicators. I’ve also seen people run this repair crew inside of various Land Raiders, as well as the Stormfang and Stormwolf. It’s not a bad little unit for 95pts. While Iron Priests are Independent Characters, they seem to be happy by themselves, surrounded by their creations in the Space Wolves background and in the Space Wolves army list. Cyberwolves are fantastic for their points! Simply surround your Iron Priest with 4 Cyberwolves, mount him on a Thunderwolf and away you go. He feels like a more affordable Thunderwolf Cavalary choice. However, if you’re running a Thunderwolf heavy list, you can attach him to a pack of Thunderwolves, giving them some ablative wounds in the form of his Cyberwolves. I’ve also seen someone running two Iron Priests on Thunderwolves with 4 Cyberwolves each in a Champions of Fenris Detachment to meet the minimum Elites requirement. They then run along with an Imperial Knight, repairing it as it advances. Although that’s 2 repair rolls of a 5+, which is a 1 in 3 chance of success. You double that up and it becomes a 1/2 chance of success overall.